International (MNN) – How can you take what God has gifted you with and use it to advance the spread of the Gospel? Sometimes, it may seem obvious if you are gifted in evangelism or preaching or service. But what if you are a musician or a wordsmith; a dancer or an artist? Global Disciples is passionate about missions, and their central focus “is to equip leaders selected by their churches to multiply Christ-like disciples, who multiply churches among least-reached people.” But they also want to encourage their partners and supporters to get involved in the Great Commission with whatever the Lord has placed in their hands. 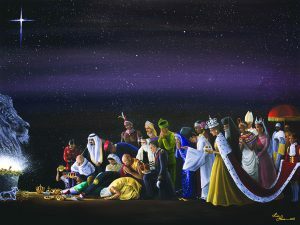 Last year, Global Disciples asked Liz Hess, a local artist in Lancaster, Pennsylvania, to paint an image they could send out on their Christmas cards. But what started as a simple art commission went viral and thousands of people were moved by the Gospel message. The Global Disciples team walked into Hess’s art gallery last year and asked if she could help them as they prepared to put together their Christmas card. They suggested she could create an image for their ministry to send out on their Christmas card as a way of saying thank you to their partners. Hess was excited about the project. As they discussed ideas for the image, Global Disciples knew they wanted international characters in the image since they are an international ministry. Together they came up with the idea of a Creche or Nativity scene. Hess was excited about this renewed concept and ran it by Global Disciples. They loved it and encouraged her to go with it. 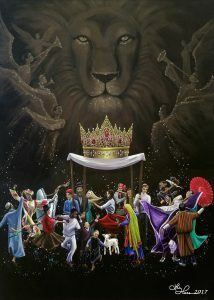 This painting was called ‘King of Kings’. The response Global Disciples heard from their partners were resoundingly positive. But as more ministries and people experienced the painting, it quickly spread. Soon Hess was getting requests to purchase prints of the image from all over the world. 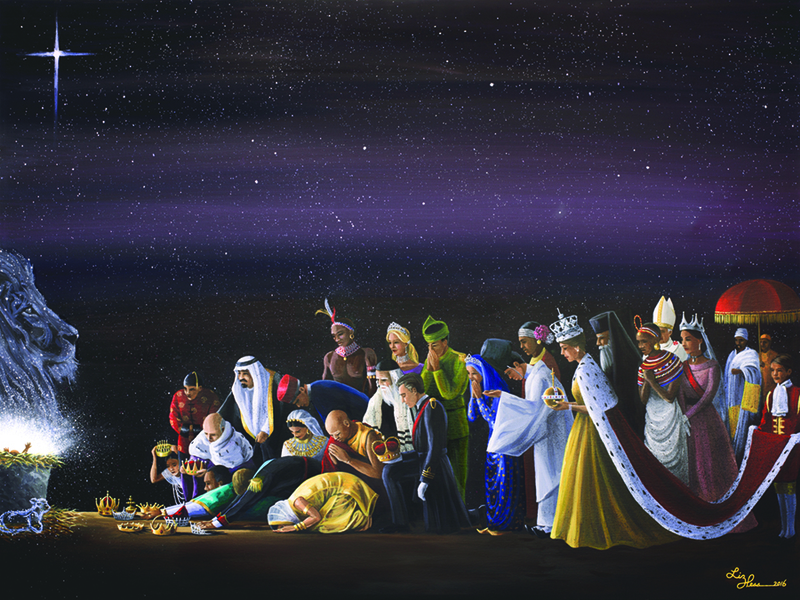 Going into 2017, Global Disciples’ founder Galen Burkholder returned to Hess’ gallery in the spring and asked if she would be willing to create another image for this year’s Christmas card. Without skipping a beat, she said yes. They agreed. Then later this year, Hess received an invitation from a ministry called The Jerusalem House of Prayer for All Nations to come visit them in Israel. They had seen Hess’ King of Kings painting from last year and loved it. Hess was looking forward to the Israel trip and Global Disciples even asked if she would paint the image for this year’s Christmas card while she was there. Again, she said yes – if the Holy Spirit gave her something to paint. She had not yet been inspired with anything from the Lord. As she sat on the plane in New York City before taking off on her journey, Hess spoke with a friend on the phone who wanted to pray for her. While in Israel, she felt inspired by various ideas of things she wanted to paint for her gallery. But nothing came to her that would specifically be for the painting with Global Disciples. Finally, the trip was close to its end. They were four days away from departure and had just arrived in Jerusalem to stay at the Jerusalem House of Prayer for All Nations. Hess says what happened next was completely the movement of the Holy Spirit. “That night, I received such a clear image. It literally came crashing into my mind. It made me stop everything. I had to write down what I was seeing. I wasn’t having a vision per se. But it was such a clear mental image that came out of nowhere. I wasn’t thinking about it. It was very random. But the word crashing is what I use because it literally just crashed through my mind. There was this image with all these details. So I started writing everything down. The image Hess was given depicts a Jewish huppah held up by four Jewish characters and there are international characters dancing around it. Under the huppah is a lamb, and above is a lion. She named this image ‘The King Has Come’. 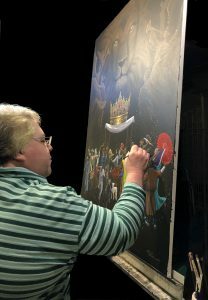 The paintings have raised awareness for Global Disciples’ ministry as well. And a portion of all sales for the two paintings go directly to support missions through Global Disciples. Hess hopes that she can be an encouragement to Christians everywhere who want to use their gifts for God. “I think the arts – whether it be music, writing, dance, painting, anything involved in the arts – I think are closest to the heart of God because they are the creative giftings and he is the great Creator…. I think that is why that particular gifting is so under attack. There is so much dark art out there and music and writing and I think that’s why that whole realm is so attacked. And those of us Christians who are musicians or writers or artists or dancers or whatever we are, to be that vehicle, that platform for communication is so impactful.